It’s the Year of the Pig, the twelfth animal in the Chinese Zodiac calendar. So it seems only fitting that Cochon555, a gala celebration of Heritage pork, bring their chef-driven gala to North Texas this Sunday. 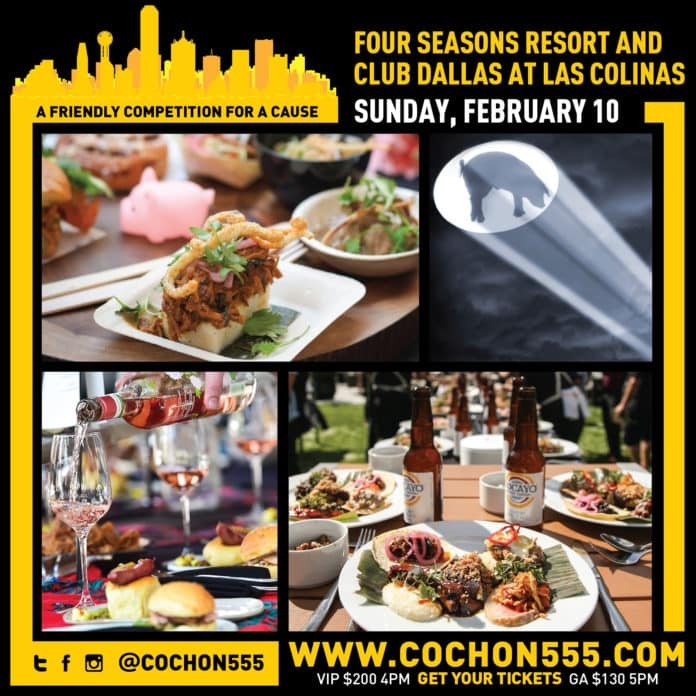 Cochon555 will be held Feb. 10 at Four Seasons Resort and Club Dallas at Las Colinas, 4150 N. MacArthur Blvd. in Irving. VIP entry starts at 4 p.m. with general admission at 5 p.m. General admission tickets start at $130, while VIP tickets (for early admission plus exclusive access to cocktail competition) are $200. Visit cochon555.com/us-tour/2018-dallas/ for tickets or more information. With an all-star cast of chefs who specialize in whole animal cooking, paired with farmers responsibly raising delicious heritage breed pigs, Cochon555 brings an all-inclusive feast. Hosted by the beautiful Four Seasons Resort and Club Dallas at Las Colinas, there are more than one hundred prominent chefs, farmers, sommeliers, distillers, brewers and barkeeps featured. They are working in concert to create luxurious moments that educate the palate. At the heart, Cochon555 aims to create moments of inspiration, and to engender discussion and action – to buy, to cook, shop and donate in the name of safe, honest, and delicious food. Communal feasting is an integral part of the culinary fabric at Cochon555. Their events are theaters for innovative spirit, wine, and cocktail experiences. Featuring 1,500 pounds of responsibly raised heritage breed pork and dozens of delicious drinks from some of the best bars in Dallas. The Welcome Lounge features punches featuring Buffalo Trace and our signature Cheese Bar featuring Schuman Cheese and Cypress Grove. Sip sparklers from Dry Soda and Topo Chico and The Manhattan Project features premium ryes, bourbon and whiskeys topped with Luxardo cherries. Learn about pairings at the TarTare Bar aligned to the wines of Antica Napa Valley, stunning Rosé from Château D’Esclans paired with organic pates from Les Trois Petits Cochons and an innovative spin on dessert spotlighting a notable pastry chef working with Perfect Puree of Napa Valley. Cochon555 is proud to announce this year’s group of cutting-edge chefs from across the city, each cooking one whole heritage breed pig raised by a family farm. The competing chefs include Host Chef Christof Syré of LAW at Four Seasons Resort and Club Dallas at Las Colinas. Also competing are David Uygur of Lucia, Matt McCallister of FT33, and Misti Norris of Petra and the Beast. One week before the event, each chef receives a 200-pound heritage breed pig sustainably sourced from Black Hill Meats, Chubby Dog Farm, Legend Meats, Blackland Prairie Pork, and Augustus Ranch to create a maximum of 6 dishes for competition. With dozens of bites from iconic local chefs, boutique distillers, and artisan winemakers, the event is akin to an epic tasting menu of heritage breed pork. There will also be endless beverage pairings. To win the friendly competition for a cause, a chef’s menu must woo twenty celebrity judges with their “Judge’s Plate.” These are scored on utilization; technique; and overall flavor. Then they must be voted “best bite of the day” by guests. The winning “Prince or Princess of Pork” in Dallas will advance to the national finale, Grand Cochon, a head-to-tail, winner-takes-all showdown for the crown in Chicago on September 30. Two satellite beverage competitions complement the whole-animal tilt. Punch Kings, a whole bottle, large-format spirit competition featuring five top barkeeps in a hand-crafted punch challenge, and Somm Smackdown, a face-off of five top sommeliers pairing the best wine with heritage pig. Placing the spotlight on “knowing where your food comes from,” each event features an educational whole animal butchery program called the Pop-Up Butcher Shop. There is a Silent Auction to benefit charity. Together with gifts from chefs, sponsors and John Boos & Co., they will raise money to benefit Piggy Bank, a start-up farm in Missouri that serves as a kickstarter for new family farms and a safety net for those in the wake of a disaster (flood, fire and disease). As an accelerator, Piggy Bank supplies piglets to small farms in exchange for business plans that are posted online in the name of transparent “open-source agriculture”.